Care Instructions: HAND WASH ONLY NOT microwave or dishwasher safe. Dimensions: 6.1"H x 4" W, Volume: 16 oz. 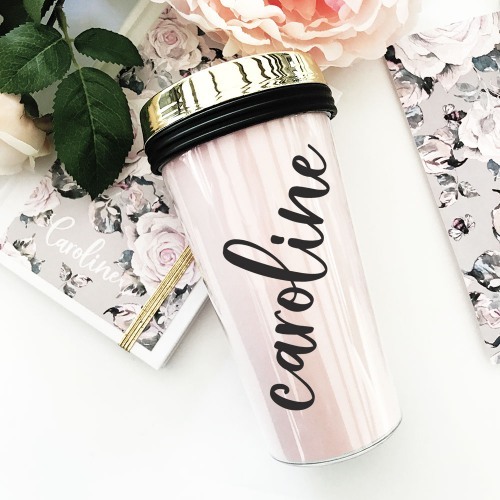 The Personalized Gold Travel Tumbler is a perfect party gift for any coffee lover! Each mug is made of acrylic and comes with a gold twist off lid. Personalize the tumbler with her favorite background color, text color, and a custom name. Travel mugs are made of Acrylic and are BPA free, the perfect and thoughtful gift to the ladies in your life.